Blood drawing, or venipuncture, is a complicated medical procedure that requires expert tuition to properly master, the kind of expert tuition we offer on our Phlebotomy Program here at Northwest Career College. Aside from a steady hand and a good teacher, venipuncture requires the use of proper phlebotomy equipment in order for the result of any blood analysis conducted on the blood sample to be reliable. In this article, we will be looking at what tools and equipment a phlebotomist might use during a blood draw and what you can expect to be trained on when you enroll in our Phlebotomy Program. Personal protective equipment, or PPE, is a mandatory part of any venipuncture procedure. It is vital that the phlebotomist always wear a protective barrier so they are protected from possible contamination by blood-related pathogens that may be present within blood drawn from a patient. The reverse is also true. A phlebotomist can be expected to make several blood-draws a day and the use of PPE, such as non-sterile gloves, provides a protective barrier for the patient, ensuring that they will not be exposed to pathogens that may be present on the hands of the phlebotomist. The use of PPE is an important step in protecting the health of the patient, preventing disease-causing organisms from entering the body through an injection site during the blood-drawing process. Once the gloves have been used in the drawing process, they should be removed and disposed of in a safe manner. To remove the gloves properly and safely, the phlebotomist uses the index finger and thumb of one hand to grasp the cuff of the glove on the opposite hand. In this manner, the glove should be removed completely, turned inside out and compressed by the gloved hand. The remaining glove is removed in much the same way, using the bare finger of the ungloved hand and hooking it under the cuff of the glove before drawing it off over the hand, trapping the other glove inside it. This careful removal ensures that the phlebotomist is protected from exposed pathogens on the surface of the glove. The tourniquet is a piece of phlebotomy equipment used as a vein compressor. Normally a band of nylon or plastic that is tightened over the upper arm, 3 to 4 inches above the site to be injected. The tourniquet prevents of blood flow to the heart, causing the vein beneath the tourniquet to become enlarged. The use of a tourniquet makes the vein more visible to the phlebotomist and allows for an easier venipuncture procedure. A lancet is a single-use laboratory tool that is generally used on the finger or heel of an infant or young child in order to draw blood. Using a lancet makes the blood collection process faster and easier for younger children, as it quickly punctures the capillaries in the finger or heel and can be removed immediately. While not entirely painless, the use of lancet is considerably quicker than using a butterfly needle and helps to limit the stress and discomfort for younger patients. The Butterfly Needle, also known as the winged infusion set, is a standard tool that is used by nearly all phlebotomists. The butterfly needle is used to puncture a vein and draw venous blood for diagnostic testing. The needle draws its name from the flexible rubber “wings” at the base of the hypodermic needle that allows for precise placement of the needle. The needle is also connected to a flexible small-bore transparent tubing and a connector that can be attached to an evacuated collection tube in which the blood sample will be stored. The benefit of the butterfly needle over the standard straight needle is that its precise placement facilitates venipuncture of thin, fragile, or superficial veins, such as those in the hand or scalp. Evacuated Collection Tubes (ECT) are used by phlebotomists to store the blood collected by a completed venipuncture procedure. ECTs are generally made from plastic or glass with a colored, rubber top. The color of each top is used indicate the specific diagnostic test to be performed on the contents and what, if any, additive is already in the tube. 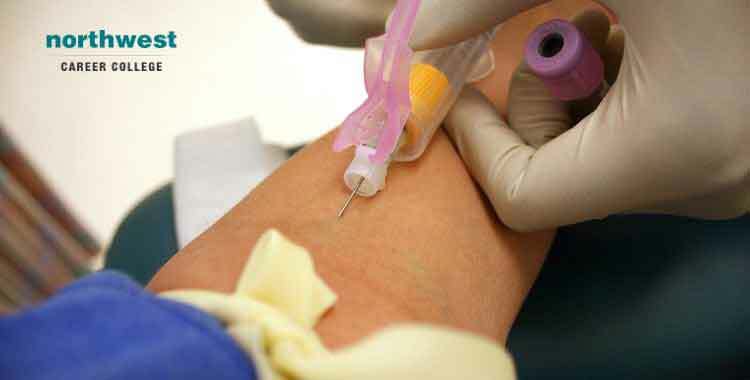 Before the phlebotomist inserts the butterfly needle into the patient’s vein, a tube with a sterilized top is inserted into the connector attached to the needle without being pierced. Once the needle is inserted the tube is pushed further into the connector, piercing the top and using the vacuum created by the tube to draw the blood into it. At Northwest Career College, we pride ourselves on providing one of the premier Phlebotomy Schools in Las Vegas. Our phlebotomy students have an 89% national exam pass rate and you can graduate in as little as three months. Our established seasoned instructors will take you through every aspect of Phlebotomy and Northwest offers day, afternoon and night classes to accommodate your busy Las Vegas work and family schedule. Call us today at (702) 403-1592 to speak to one of our admissions specialists about your new Phlebotomy career.